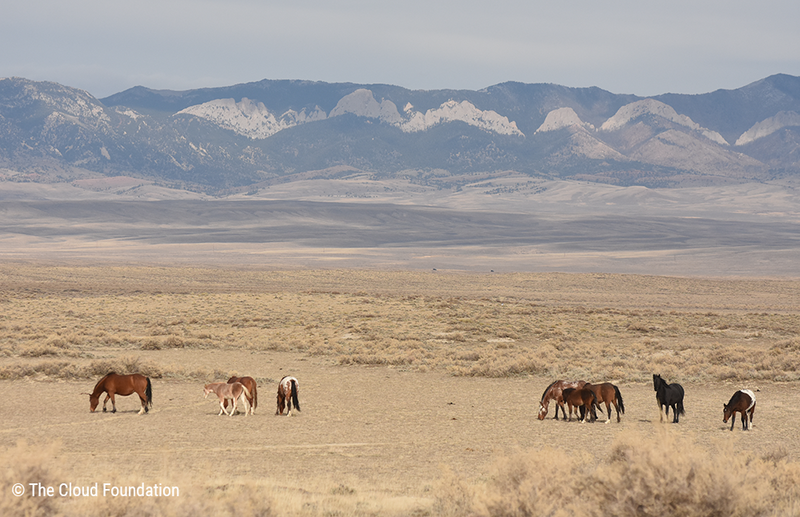 This winter, I had my second-ever encounter with a wild horse herd. It was an experience I won't soon forget. Alongside TCF Executive Director, Ginger Kathrens, I ventured out into the Stewart Creek area of Wyoming, just north of Rawlins, Wyoming. Two friends from Casper, Chad and Lynn Hanson, met us on the mild, overcast morning. Had it not been for the wind, it would have been a nice day, but the wind blew so hard that it chilled me to the bone on more than one occasion. From Highway 287 we drove our two vehicles onto a wide dirt road surrounded by sage and beautiful mountains. After just a mile or so, cattle dotted the landscape around us. Within a few minutes, we counted 200 head of cattle. The forage looked passable, but I worried about all the livestock grazing so late in the season. 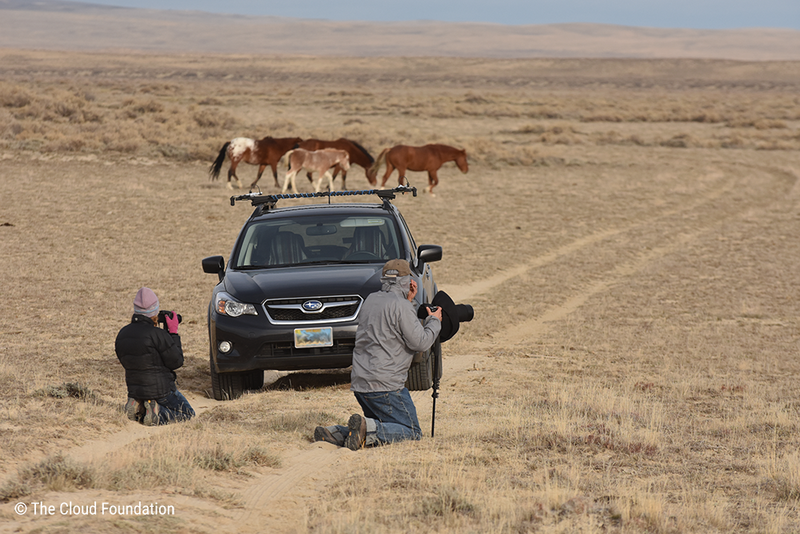 Fortunately, I was distracted from this fretting by the beautiful site of pronghorn and deer running alongside our car together, in tandem – something Ginger said was a rare sight. About twenty miles down the road, we finally saw distant dots that didn’t look like cattle but they disappeared behind a hill before I could get a good look. With Chad leading the way, we took a right onto a bumpy, overgrown two-track road that headed toward the dots. As we passed a lone post topped with a massive eagle’s nest and came around the bend, we finally saw them – two bachelor stallions! They stayed nearby, trotting to and fro, never getting farther away or closer and always keeping an eye on us. We got out and walked a bit closer. It was a beautiful, quiet moment. All of us animals were peaceful as we examined one another. Chad and Lynn told us that they typically see bigger groups nearer to the watering hole that was just a bit farther north and west, so we hopped back into our respective vehicles and headed that direction. We were not disappointed. A band of twelve or thirteen horses appeared on the left, but they wouldn’t stay for long. Some were drinking and hadn’t seen us approaching until it was too late. 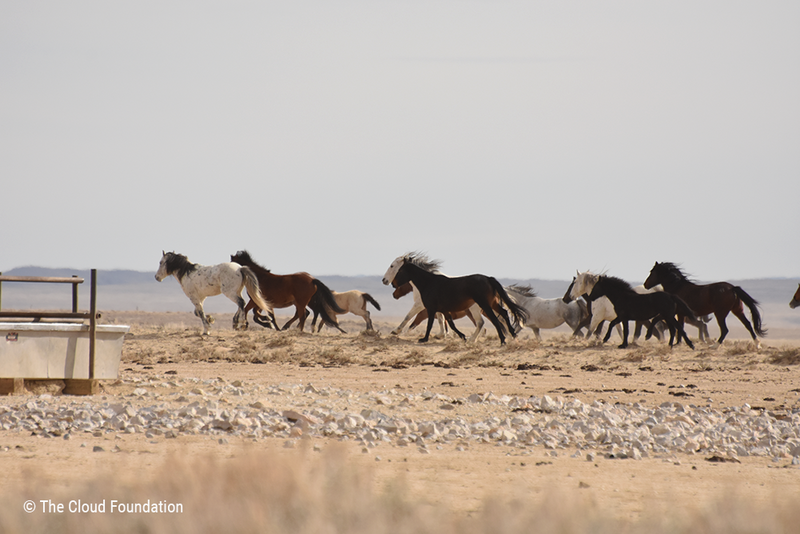 When they realized we were there, they spooked and every horse ran to the west. The ground around the watering hole was trampled to bits. Cow prints and patties were everywhere. Farther north on the road we met a strange sight - a lone horse, standing at the bottom of a ridge. 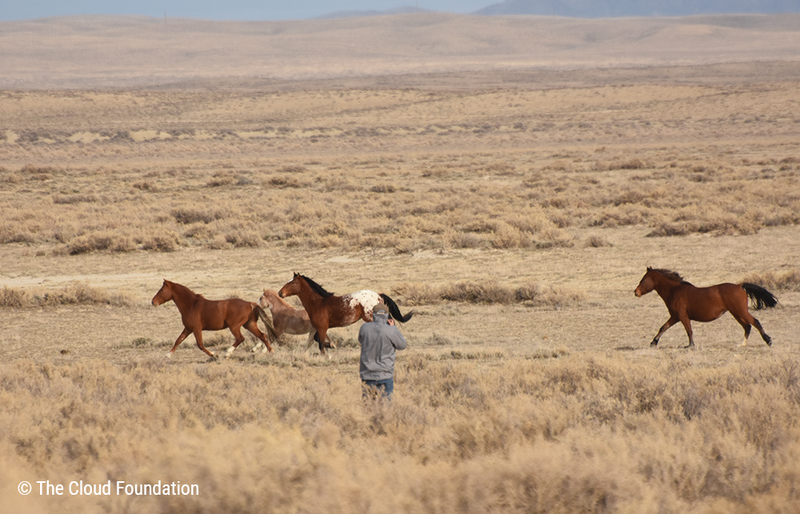 As we got out to glass and photograph, we were met with an incredible sight: dozens and dozens of wild horses suddenly appeared atop the ridge, galloping down as fast as their legs would carry them. It appeared as if many family bands had suddenly come together and started to run from something; what were they running from, we wondered? We got back into our cars and turned around to follow them as they ran down the road. We parked, thinking we’d appear less threatening on two legs, and started walking out toward them with binoculars and cameras in hand. Ginger and I kept walking slowly along the flat road, moving toward a water hole, and finally got about 50 yards away from a beautiful, multicolored band standing on the side of a rise. They regarded us with curiosity, but mostly suspicion. We slowly sat down on the ground. Just when we started to feel at peace with the animals they suddenly took off back to the north. We couldn’t figure out what caused them to run. When we rejoined Chad and Lynn, Chad had some shocking news to share: the horses had run because of an unmarked helicopter flying far above. We were furious! That explained why all the horses we had seen all day – except our two curious bachelor stallions in the morning – had run away nearly as soon as they saw our vehicles. There were helicopters hovering nearby, scaring them away from their normal range haunts. We were devastated, and really confused; it was the observed holiday for Veterans Day, so surely no government agencies would have helicopters flying around. We have yet to get to the bottom of the helicopter appearance. If only there were a way to tell the horses that we weren’t with the “other guys.” Some young foals had run miles from us with their families by our estimation. It was too late in the year for these young ones to be running off pounds. We knew it was time for us to leave the area. We back tracked to the highway and reentered Stewart Creek from another angle, and what a difference it made. 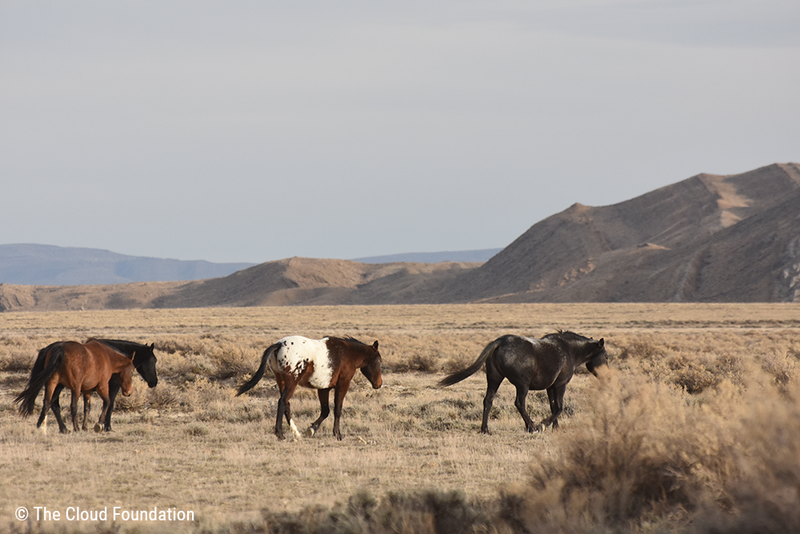 We found three of the friendliest wild horses I had ever encountered, much more like the horses I had observed a few weeks earlier in the Little Book Cliffs of Colorado. The stallion was a unique, Appaloosa-looking horse with his two mares. Lynn and Chad had named him Chief. The little family grazed near a salt lake. We were thrilled to find horses that didn’t run the instant they saw us. 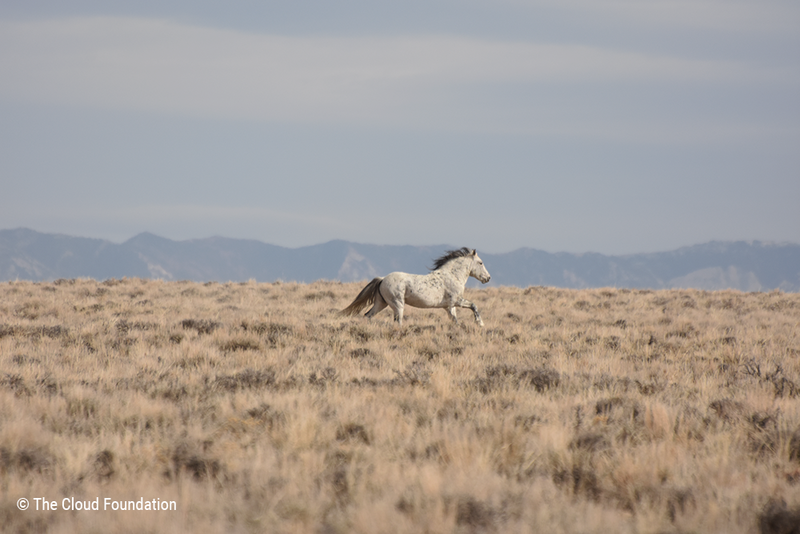 Farther on we found a band of about nine horses. Such beautiful colors! I had never seen such a variety out on the range. 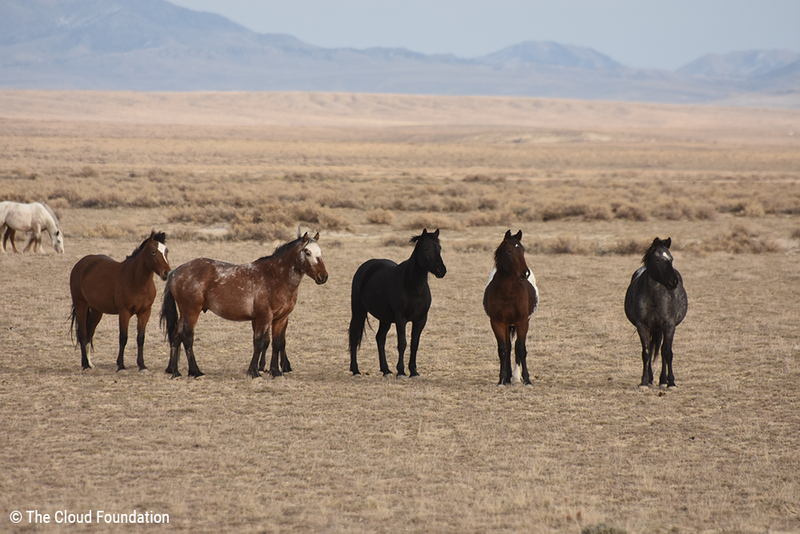 We kept driving because we saw dozens of dots in the distance that we were sure were horses – and boy, were we right! We came upon a group of four or five different family bands. Chad and Lynn stopped before we did; we kept driving closer to a family band of three. Ginger and I got out of the car and started to approach. The horses were wary and protective of their foal, but they weren’t skittish. 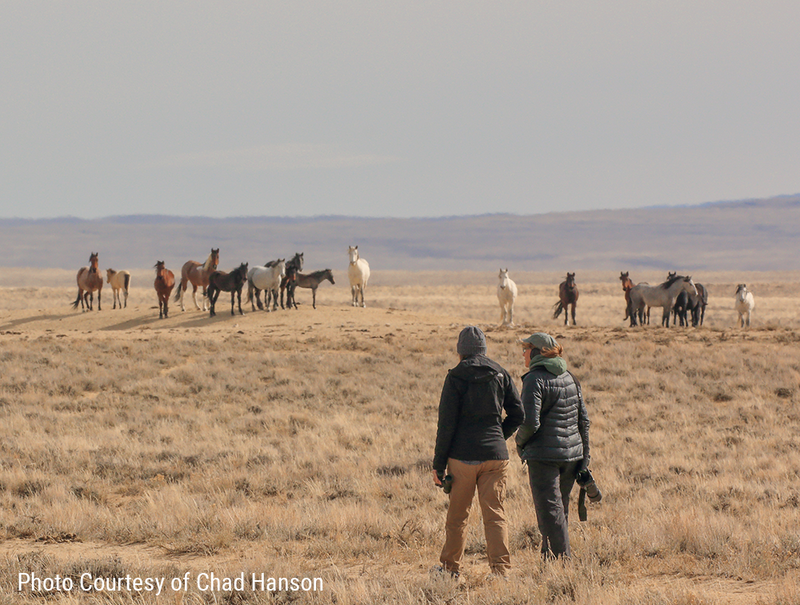 They stayed close enough to see what we were up before they started trotting away, right past Chad! “I bet he’s getting the shots of a lifetime,” Ginger said. Sure enough, he got beautiful pictures – as did Lynn who sat behind their car. She captured some intimate moments of a band that didn’t know or care that she was there. It was a beautiful, serene ending to an otherwise disconcerting day. I was happy to leave Stewart Creek on a good note before the long drive home to Colorado. P.S. Do you live in the Stewart Creek area (approximately 20 miles north of Rawlins, WY on Highway 287)? Are you interested in learning more about starting a fertility control program in this area? We would love your help! Please reach out to learn more and get involved: info@thecloudfoundation.org.